Soy beans one liter was rinsed, boiled for on hour, water discarded and rinsed, placed in pot and soaked for 12 hours, rinsed and placed in a colander, and put in a pressure cooker and cooked for one hour. The trays were then placed in the Excalibur dehydrator and the temperature monitored using a prod thermometer to be about 41 degrees centigrade for 24 hours. 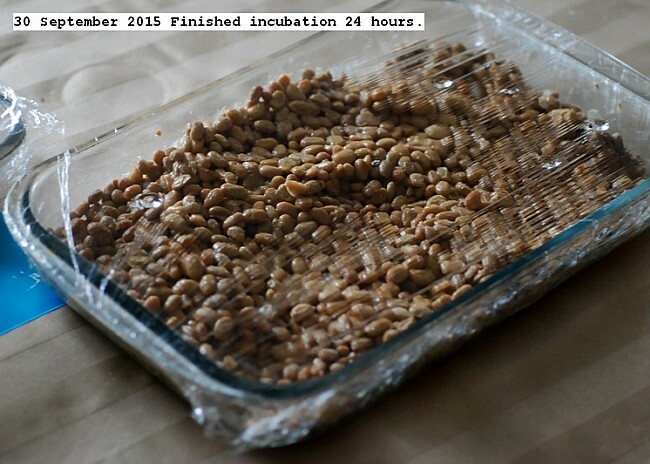 At 7,14,21 time intervals the soy beans were stirred in the trays to prevent local dehydration of the top layer of the beans.